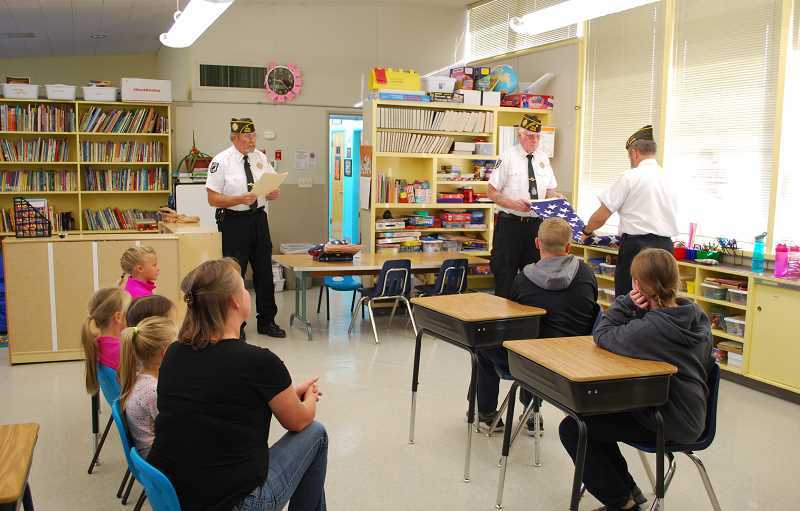 Ashwood Elementary School students were visited Oct. 24, by members of Madras VFW Post 12141. Ashwood Elementary School students were visited Oct. 24, by members of Madras VFW Post 12141 for a lesson on proper flag folding. VFW members Jon Granby, Len Parsons, Duane Ledford, Leonard Hellwig, and District 10 Commander Floyd Leach demonstrated the triangular flag-folding technique, and the meaning behind the ritual. "There are 13 folds to the flag, with an interpretation to each fold," Hellwig noted. In Ashwood, it is the student's responsibility to put the flag up and take it down each day, and teacher Melanie Friend contacted the VFW to teach the kids flag etiquette. "They also had three old flags that had been flown in the past that they gave us to be disposed of properly," Hellwig said.